Salmonella infects and survives within B cells, but the mechanism used by the bacterium to promote its survival in these cells is unknown. In macrophages, flagellin secreted by Salmonella activates the Nod-like receptor (NLR) family CARD domain containing protein 4 (NLRC4) inflammasome, leading to the production of IL-1β and pyroptosis of infected cells. In this study, we demonstrated that the NLRC4 inflammasome is functional in B cells; however, in Salmonella-infected B cells, IL-1β secretion is prevented through the downregulation of NLRC4 expression. A functional Salmonella pathogenicity island 1 type III secretion system appears to be required for this process. Furthermore, infection induces Yap phosphorylation and promotes the interaction of Yap with Hck, thus preventing the transcriptional activation of NLRC4. The ability of Salmonella to inhibit IL-1β production also prevents B cell death; thus, B cells represent an ideal niche in which Salmonella resides, thereby promoting its persistence and dissemination. During Salmonella infection, B cells produce a robust response against protein and nonprotein Ags (1). B cells are essential for protective immunity to oral challenge; Salmonella-specific Abs protect against secondary infection (2). Furthermore, it has been demonstrated that B cells are required for priming the CD4+ and CD8+ T cell responses during infection (3). However, B cells have additional roles during Salmonella infection, and there is evidence that Salmonella infects B cells in vivo and in vitro (3–9). Within B cells, Salmonella resides in a late endosomal compartment that is distinct from the Salmonella-containing vacuoles observed in macrophages (8). In addition, the bacteria infect B cell precursors in the bone marrow, and these cells may serve as reservoirs of Salmonella infection (10). During host infection, pathogen recognition by the innate immune system occurs through a number of pattern-recognition receptors, such as TLRs, Nod-like receptors (NLRs), and others. Activation of pattern-recognition receptors is fundamental for the initiation of signaling networks that culminate in a proinflammatory immune response. TLRs are located in the plasma membrane and vacuolar compartments, whereas NLR receptors are located in the cytoplasm (11). During Salmonella infection, LPS and other Ags activate TLR pathways to produce TNF-α, IL-6, IL-12, and various chemokines (12), whereas the NLR family CARD domain containing protein 4 (NLRC4) inflammasome recognizes flagellin monomers and triggers caspase-1 activation and the subsequent processing of pro–IL-1β and secretion of the mature form of IL-1β (13, 14). IL-1β induces pyroptosis in infected cells, promoting bacterial dissemination. In fact, caspase-1–deficient mice survive Salmonella infection because the spread of bacteria is abolished because of the absence of cell death (15). NLRC4 was initially described as a proapoptotic molecule (16), and its transcription is activated by the p53 transcription factor family (17). The most efficient transcription of NLRC4 occurs when the p73/Yap heterodimer binds to its promoter region (18, 19). Negative regulation of the expression p73/Yap target genes requires cytosolic sequestering by two mechanisms: Yap phosphorylation at S127 (20) or a direct interaction of Yap with Hck (18). Both mechanisms prevent the nuclear translocation of Yap and the subsequent activation of gene expression, including NLRC4. In this work, we demonstrate for the first time, to our knowledge, that Salmonella infection inhibits IL-1β secretion through the downregulation of NLRC4 in B cells. This event could explain why B cells are resistant to Salmonella-induced cell death. Yap phosphorylation and Yap–Hck interaction are involved in the downregulation of NLRC4 during Salmonella infection. We suggest that NLRC4 downregulation is a virulence mechanism of Salmonella that promotes its survival in B cells. These findings indicate that B cells may facilitate the dissemination and persistence of Salmonella during infection. Primary cells were obtained from 8-wk-old female BALB/c mice (Experimental Medicine Department, School of Medicine, Universidad Nacional Autonoma de Mexico, Mexico City, Mexico). Splenic B cells were obtained by CD43 negative selection (Miltenyi Biotec, Cambridge, MA) and resuspended in RPMI 1640 medium (Miltenyi Biotec) supplemented with 10% FBS (Life Technologies BRL, Carlsbad, CA). Bone marrow cells were obtained from the femurs of mice and cultured in RPMI 1640 medium supplemented with 10% FBS, antibiotics (Life Technologies BRL), and 30% L-929 cell culture supernatant for 5 d. After washing with PBS, bone marrow–derived macrophages (BMDMs) were collected (21). For IL-1β secretion assays, B cells and BMDMs were preactivated with 100 ng/ml LPS for 16 h before infection (14). Wild-type Salmonella enterica serovar Typhimurium 14028 (American Type Culture Collection) was used in this study. The Salmonella mutant prgH (ΔprgH) strain was kindly donated by Dr. Samuel I. Miller (Washington University, Seattle, WA). Salmonella 14028 carrying the plasmid pEM180, which expresses GFP under the ampicillin promoter, was grown in the presence of 100 μg/ml ampicillin (22), and it was used as GFP-expressing S. typhimurium (S. typhimurium-GFP). The mutant ΔprgH was grown in medium supplemented with 35 μg/ml kanamycin. All strains were grown overnight in Luria Bertani (LB) medium at 37°C with shaking, diluted 1:30 with fresh LB medium, and cultured until reaching the logarithmic phase. An OD of 0.6 at 540 nm was used to adjust the bacterial concentration and obtain the desired multiplicity of infection (MOI). Bacteria grown in LB broth containing 300 mM NaCl was used to express the Salmonella pathogenicity island 1 (SPI-1) genes (23). LB-cultured bacteria supplemented with 100 μg/ml chloramphenicol and incubated for an additional 1.5 h at 37°C without shaking were used to inhibit protein synthesis (24). Cells were obtained from a logarithmic phase culture, washed with PBS, and fixed with 0.5% paraformaldehyde (PFA) for 1 h at room temperature to fix bacteria. The bacteria were centrifuged at 10,000 rpm for 10 min and washed with PBS to remove the PFA. B cell infection was performed in suspension (6), whereas BMDM infection was conducted using a monolayer cell model (25). For both of these assays, 1 × 106 cells were infected for 30 min at the indicated MOI and cultured in RPMI 1640 supplemented with 30 mg/ml gentamicin. Bacterial CFUs were recovered at 1, 3, and 24 h postinfection (25). The levels of TNF-α, IL-1β, and IL-6 in culture supernatants were determined by a quantitative sandwich enzyme immunoassay (R&D Systems, Minneapolis, MN) (14). B cells and BMDMs were infected at the indicated MOI as described previously, and culture supernatants were collected at 24 h postinfection for the ELISAs. B cells were placed in contact with Salmonella-GFP for 30 min, washed with PBS supplemented with 100 μg/ml gentamicin three times, and then immediately separated into GFP+ (cells with internalized Salmonella) and GFP− (cells that were only in contact with Salmonella) pools using a MoFLo cell sorter. GFP+ and GFP− cells were cultured in RPMI supplemented with FBS (10%) and gentamicin (100 μg/ml). Total RNA was isolated from 3 × 106 B cells or BMDMs using TRIzol reagent (Invitrogen, Carlsbad, CA). Semiquantitative RT-PCR was performed using a one-step RT-PCR kit (Invitrogen). The primers used for amplification are NLRC4: sense 5′-TCAGGATGAACG AGGAAGATGC-3′, antisense 5′-ACTTCAACCACCGGACGACA-3′; caspase-1: sense 5′-TGGTCTTGTGACTTGGAGGA-3′, antisense 5′-TGGCTTCTTATTGGCAGAT-3′; IL-1β: sense 5′-ATGGCAA CTGTTCCTGAACTCAACT-3′, antisense 5′-CAGGACAGGTATAGA TTCTTTCCTTT-3′; and HPRT: sense 5′-TCCACCTGGAGAAGGC-3′, antisense 5′-GCTAA GCAGTTGGTGGTGCA-3′. For NLRC4 quantitative RT-PCR (qRT-PCR), cDNA was synthesized using a high-capacity cDNA reverse transcription kit according to the manufacturer’s instructions (Applied Biosystems, Foster City, CA), and qRT-PCR reactions were performed using following primers: sense 5′-ATGTCATTTACTGTGAGC CCTTGG-3′, antisense: 5′-TTGCCAGACTCGCCTTCAATC-3′ and SYBR Green PCR master mix (Applied Biosystems) according to the manufacturer’s instructions. A standard curve was used to quantify NLRC4 expression. The data were analyzed using ABI StepOne software. The chromatin immunoprecipitation (ChIP) assay that we devised for our work was an extension of previous protocols with some modifications (26). In brief, 5 × 107 B cells were cross-linked with formaldehyde (1% final concentration) 5 min at room temperature after glycine was added at a final concentration of 0.125 M. After washing twice with ice-cold PBS, cells were resuspended in ice-cold cell lysis buffer 1 and incubated on ice for 10 min. Nuclei were recovered by centrifugation, resuspended in lysis buffer 2, and incubated 10 min on ice. Samples were centrifuged and resuspended in 2 ml sonication buffer. Chromatin samples were precleared for 1 h at 4°C by adding 50 μl protein A-agarose beads (Invitrogen) and 1 μg DNA from salmon sperm (Sigma-Aldrich), followed by incubation with 1 μg Yap Ab (Santa Cruz Biotechnology) in nondenaturing lysis buffer at 4°C overnight. Immune complexes were recovered at 4°C for 2 h by using 60 μl protein A-agarose beads and 1 μg DNA from salmon sperm. Complexes were washed five times with IP1, once with IP2, and twice with Tris-EDTA pH 8.0. Immunoprecipitation reactions and input chromatin were digested with 200 μg/ml RNase A for 1 h and 200 μg/ml proteinase K in Tris-EDTA buffer with 0.5% SDS for 2 h at 55°C. Cross-links were reversed overnight at 65°C. Samples were obtained using a DNA extraction kit (Zymo Research, Irvine, CA) and analyzed by real-time PCR using following primers: sense 5′-TGCCCTCTATACTAGGGTCAGATT-3′, antisense 5′-CTTCTCTTGGCAAGGCTCTC-3′ and SYBR Green PCR master mix (Applied Biosystems) according to the manufacturer’s instructions. To stimulate the cytosolic NLRC4 with soluble flagellin, we used Dharmafect-1 (DF) (Thermo Scientific, Suwanee, GA) according to the manufacturer’s instructions. DF (2 μl) was diluted in 200 μl serum-free medium and incubated for 30 min with 2 μg purified flagellin (Invitrogen, San Diego, CA). After incubation, 200 μl medium was added, and a 100-μl aliquot was used to stimulate B cells or BMDMs (1 × 105, seeded in 96-well plates) for 3 h for the caspase-1 activity assay or for 16 h for the IL-1β secretion assays. For caspase-1 activity, cells were then stained with an active caspase-1–specific fluorescent probe (FAM-YVAD-FMK; Immunochemistry Technologies, Blooming, MN) according to the manufacturer’s instructions. For infected cells, bacteria were stained with a polyclonal anti-Salmonella Ab and an anti-rabbit tetramethylrhodamine isothiocyanate Ab (Sigma). Cells were analyzed by confocal microscopy (LSM 510 Meta; Zeiss). B cells or BMDMs were infected or stimulated as described previously (13). Twenty-four hours later, cytotoxicity was determined by lactate dehydrogenase (LDH; Promega, Madison, WI) release assay. The percentage of LDH release was calculated using the following formula: percentage of release = (experimental LDH release − spontaneous LDH release)/(maximal LDH release − spontaneous LDH release) × 100% (13). Cytosolic and nuclear proteins were obtained from noninfected and infected B cells using a ProteoJet kit (Fermentas, Waltham, MA) according to the manufacturer’s instructions and solubilized in Laemmli sample buffer. Samples were resolved by 10% SDS-PAGE and transferred to a nitrocellulose membrane. Membranes were blocked in BSA (5%) in PBS containing 0.1% Tween and incubated with anti p-Yap S127 Ab (Cell Signaling), anti-Yap (Cell Signaling, Beverly, MA), anti–laminin B (Santa Cruz Biotechnology), or anti–β-tubulin Ab (Zymed, San Francisco, CA). Proteins were detected by chemiluminescence (Thermo Scientific). For immunoprecipitation, lysates from noninfected and infected B cells were precleared with protein A-Sepharose beads (Invitrogen, Carlsbad, CA) for 1 h, followed by immunoprecipitation with anti-Yap Ab (Santa Cruz Biotechnology) and immunoblotted for Hck (Santa Cruz Biotechnology). NLRC4 was immunoprecipitated using a polyclonal anti-NLRC4 Ab and by immunoblotting with the same Ab (Cell Signaling). B cells were treated with doxorubicin (500 ng/ml; Sigma), infected with Salmonella, and treated with doxorubicin alone or LPS (100 ng/ml) in addition to doxorubicin for 4 h. Cells were fixed with 2% PFA and labeled by TUNEL using an In Situ Cell Death Detection Kit (Roche, Basel, Sweden). Cells were analyzed by flow cytometry or fluorescence microscopy (23). The data represent the mean ± SD and were analyzed by one-way ANOVA followed by a post hoc Tukey’s comparison. In some cases, data with normal distribution were analyzed using Student t test. The p values <0.05 was considered significant. The data were analyzed using GraphPad Prism 3 software. In response to Salmonella infection, macrophages produce proinflammatory cytokines such as TNF-α and IL-6 through TLR activation (27) and IL-1β and IL-18 through NLR activation (13, 14). These cytokines promote the control of bacterial infection (22, 28). We investigated whether B cells produced proinflammatory cytokines in response to Salmonella infection. For this purpose, we purified B cells from spleens (purity > 99%) (Supplemental Fig. 1A). B cells were infected with Salmonella at different MOIs, and we found that IL-1β secretion decreased with MOI of 10, 56.4 ± 11.0 pg/ml IL-1β, and 11.2 ± 2.2 pg/ml IL-1β at MOI of 50. In contrast, as has been reported previously (13, 14), macrophages increased IL-1β secretion in a dose-dependent manner during infection (MOI 10: 292.0 ± 121.6 pg/ml; MOI 50: 1445.0 ± 176.8 pg/ml; Fig. 1A). We also found that IL-18 secretion is inhibited in B cells, but not in macrophages (Supplemental Fig. 2). 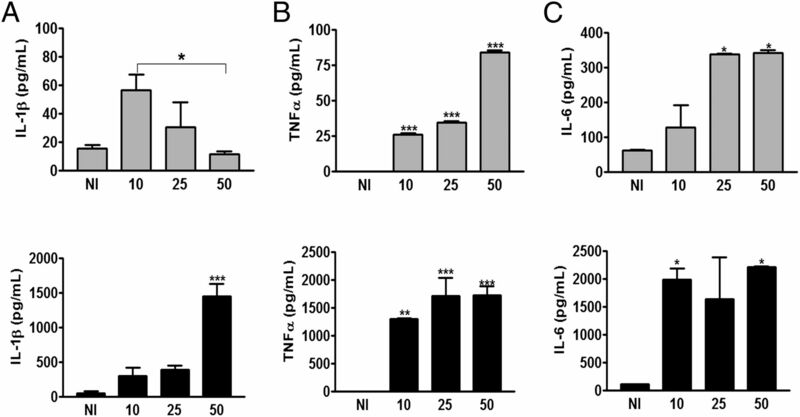 TNF-α and IL-6, which are secreted in response to TLR stimulation, were secreted in a dose-dependent manner in both B cells and macrophages (Fig. 1B, 1C). These results suggest that activation of the inflammasome is different in B cells than in macrophages because we observed that Salmonella could modulate the activation of this complex and inhibit IL-1β and IL-18 secretion in B cells, but not in macrophages. Salmonella prevents IL-1β secretion in B cells. (A) B cells (gray bars) or BMDMs (black bars) were stimulated for 24 h with LPS (100 ng/ml) and then infected with Salmonella at the indicated MOI. At 24 h postinfection, IL-1β levels were measured in the cell culture supernatant by ELISA. (B) B cells or BMDMs were infected with Salmonella at the indicated MOI. TNF-α levels were measured in the cell culture supernatant at 24 h postinfection by ELISA. (C) B cells or BMDMs were infected with Salmonella at the indicated MOI. IL-6 levels were measured in the cell culture supernatant at 24 h postinfection by ELISA. *p < 0.05, **p < 0.01, ***p < 0.001. Because we observed that the ability of B cells to produce IL-1β is dampened in the presence of Salmonella, we evaluated the expression of the NLRC4 inflammasome components caspase-1 and IL-1β using semiquantitative RT-PCR. We found that in infected B cells, the expression of NLRC4 was decreased, whereas that of caspase-1 and IL-1β was not affected (Supplemental Fig. 3A, 3B). In addition, we analyzed the functionality of the NLRC4 inflammasome in B cells. The cytosol of B cells or macrophages was loaded with flagellin, and the secretion of IL-1β and the activity of caspase-1 were evaluated. Whereas B cells were able to secrete IL-1β (145 ± 26.7 pg/ml) when they were stimulated with flagellin (Fig. 2A, gray bars), they secreted only 19.1 ± 9.0 pg/ml IL-1β when they were infected with Salmonella at an MOI of 50. By contrast, macrophages secreted IL-1β in response to both cytosolic flagellin and bacteria (Fig. 2A, black bars). The enzymatic activity of caspase-1 is required for IL-1β secretion (29); thus, we evaluated the activity of caspase-1 in Salmonella-infected or flagellin-stimulated B cells using an fluorescent labeled inhibitor of caspases (FLICA). Thirty-five percent of B cells exhibited caspase-1 activity when they were stimulated with flagellin, and 12.9% of Salmonella-infected B cells displayed caspase-1 activity, similar to baseline (9%). Moreover, the FLICA signal was stronger in flagellin-stimulated cells than in Salmonella-infected cells (Fig. 2B). Macrophages exhibited caspase-1 activity when they were stimulated with flagellin and during infection (Fig. 2C). These data demonstrate that the NLRC4 inflammasome is thoroughly active in B cells, but Salmonella can impair its activity, thus preventing the secretion of IL-1β. The NLRC4 inflammasome is functional in B cells. (A) B cells (gray bars) or BMDMs (black bars) were stimulated for 24 h with LPS (100 ng/ml) and then infected with Salmonella at the indicated MOI or loaded with flagellin (500 ng) using DF. Twenty-four hours later, IL-1β levels were measured in the cell culture supernatant by ELISA. (B and C) B cells (B) or BMDMs (C) were infected with Salmonella or loaded with flagellin as previously described. Three hours later, cells were exposed to the fluorescent caspase-1 substrate FLICA for 1 h. Cells were analyzed by confocal microscopy. The percentage of B cells (gray bars) or BMDMs (black bars) with active caspase-1 is shown (right panel). (D) B cells were stimulated for 24 h with LPS (100 ng/ml) and then infected with Salmonella at MOI of 50, loaded with flagellin (500 ng), or infected with Salmonella. At 5 h postinfection, the cells were loaded with flagellin, and after 24 h, IL-1β levels were measured in the cell culture supernatant by ELISA. (E) B cells were stimulated for 24 h with LPS (100 ng/ml) and then infected with Salmonella at MOI of 50, loaded with flagellin (500 ng), or infected with Salmonella. At 5 h postinfection, the cells were loaded with flagellin, after 3 h, they were exposed to the fluorescent caspase-1 substrate FLICA for 1 h (left panel). Cells were analyzed by microscopy. The percentage of B cells with active caspase-1 is shown (right panel). Data are representative of two and three independent experiments. Mean ± SD is shown. Scale bar represents 5 and 10 μm in the B cell and BMDM images, respectively. *p < 0.05, **p < 0.01, ***p < 0.001. To further investigate this, we evaluated the effect of cytosolic flagellin when B cells were infected with Salmonella. B cells were infected with Salmonella and stimulated with flagellin at 5 h postinfection, and the secretion of IL-1β and activation of caspase-1 were evaluated. Cells stimulated with cytosolic flagellin could secrete IL-1β, and 67% of these cells had active caspase-1; however, when cells were infected and then stimulated with flagellin, they secreted very low amounts of IL-1β, and only 39% had active caspase-1.These results confirm that when B cells are infected with Salmonella, there is not enough NLRC4 protein to be activated by cytosolic flagellin (Fig. 2D, 2E). Using qRT-PCR, we demonstrated that Salmonella induced the downregulation of NLRC4 expression in B cells. NLRC4 expression in B cells was decreased 3-fold at 24 h postinfection (Fig. 3A). Because the activation of the NLRC4 inflammasome is important for the control of Salmonella and other pathogens (13, 14, 30), we tested whether this downregulation of NLRC4 also occurred in macrophages. In correlation with the IL-1β secretion presented previously, NLRC4 expression in macrophages was not decreased (Fig. 3B). In addition, we analyzed NLRC3 expression and observed no changes in its expression in infected B cells (Supplemental Fig. 4); therefore, we concluded that Salmonella specifically downregulates NLRC4 in B cells. Salmonella downregulates the expression of NLRC4 in B cells. (A) B cells were infected with Salmonella at an MOI of 50; at the indicated time points postinfection, total RNA was recovered, and the mRNA levels of NLRC4 were quantified by real-time RT-PCR. (B) BMDMs were infected with Salmonella at an MOI of 50; at the indicated time points postinfection, total RNA was recovered, and the mRNA levels of NLRC4 were quantified by real-time RT-PCR. (C) B cells were infected with Salmonella-GFP at an MOI of 50, and cells were immediately sorted to obtain GFP+ (B cells with intracellular Salmonella) and GFP− B cells (B cells that were in contact with Salmonella but do not contain intracellular bacteria). The cells were cultured for the indicated time. Total RNA was recovered, and the mRNA levels of NLRC4 were quantified by real-time RT-PCR. (D) B cells were treated with LPS at the indicated concentrations. (E) B cells were infected with Salmonella 14028 (live), fixed Salmonella (fix), or Salmonella treated with 100 mg/ml chloramphenicol to inhibit protein synthesis (Cm). (F) B cells were infected with Salmonella lacking prgH (ΔprgH) or Salmonella cultured in LB medium containing 300 mM NaCl (SPI-1 cond). In each case (D, E), at 24 h postinfection, total RNA was recovered, and the mRNA levels of NLRC4 were quantified using real-time RT-PCR. Data shown are the mean of three independent experiments. Mean ± SD is shown. *p < 0.05, **p < 0.01, ***p < 0.001. In addition, we analyzed the expression of NLRC4 in B cells according to their internalization of Salmonella. We infected splenic B cells with Salmonella expressing GFP, and postinfection, cells were separated by FACS into GFP+ (cells with internalized bacteria) and GFP− (cells with no internalized bacteria) pools. Then the sorted cells were cultured for 1, 3, or 24 h, and the expression of NLRC4 was analyzed. The expression of NLRC4 was decreased 3-fold in both GFP+ and GFP− cells (Fig. 3C). We reasoned that Salmonella interferes with the expression of NLRC4 through an extracellular signal in B cells. We then clarified which components of the bacteria are involved in the downregulation of NLRC4. In B cells stimulated with different concentrations of LPS, the expression of NLRC4 did not fluctuate (Fig. 3D). However, when bacteria were fixed or treated with chloramphenicol to inhibit protein synthesis, Salmonella was unable to downregulate NLRC4 (Fig. 3E). Salmonella possesses several virulence factors, including SPI-1, which contains genes important for bacterial entry into B cells (31). We evaluated whether the type III secretion system (TTSS) of SPI-1 is required for NLRC4 downregulation in B cells. A Salmonella ΔpgrH mutant, which lacks a TTSS, did not alter the expression of NLRC4. These data may indicate that an effector of SPI-1 is responsible for the downregulation of NLRC4; therefore, if we induced the expression of SPI-1 effectors in Salmonella, then we would expect depletion of NLRC4 expression in B cells. Surprisingly, when Salmonella was grown in the presence of NaCl (300 mM), a condition reported to induce the expression of SPI-1 effectors (23), we observed a 2-fold increase in the expression of NLRC4 (Fig. 3F). This result could imply that the protein involved in NLRC4 downregulation is secreted by the TTSS encoded in SPI-1 but is not under the transcriptional control of SPI-1. Altogether, these results establish that in B cells, but not in macrophages, Salmonella induces a decrease in NLRC4 expression, and that this occurs in an extracellular manner and requires the TTSS encoded in SPI-1. NLRC4 transcription is activated by p53 (17) and p73/Yap (18). It has been previously observed that the transcription of p53 target genes is more efficient when they are activated by p73/Yap (19). The mechanisms related to the negative control of the expression of p73/Yap target genes involve the phosphorylation of Yap at S127 (20) or its interaction with Hck (18). We analyzed the phosphorylation status of Yap at S127 and its interaction with Hck in infected B cells. We observed that Yap was phosphorylated at 1 h postinfection and remained phosphorylated until 24 h postinfection (Fig. 4A); likewise, Yap interacted with Hck at 2 h postinfection, and this interaction continued until 24 h postinfection (Fig. 4B). These results reveal that Salmonella induces Yap phosphorylation and its interaction with Hck. These events prevent Yap translocation to the nucleus; consequently, this coactivator is not present in the NLRC4 promoter region, resulting in its downregulation. Both of these events could result in Yap retention in the cytosol and prevent its translocation to the nucleus, resulting in inefficient NLRC4 transcription. To test this hypothesis, we evaluated Yap in the nuclei of infected B cells and found that the presence of Yap in the nuclei of infected cells is significantly diminished (Fig. 4C). If the presence of Yap is diminished in the nucleus during infection, it might have consequences on Yap binding to the NLRC4 promoter region; we thus performed a ChIP assay to test this, and we observed that Yap is not present on the NLRC4 promoter region in infected B cells (Fig. 4D). Moreover, the absence of Yap in the NLRC4 promoter region correlated with the downregulation of NLRC4 mRNA. Finally, we evaluated whether the downregulation of NLRC4 mRNA correlated with the protein level of this molecule by immunoprecipitation and Western blotting with a polyclonal NLRC4 Ab. NLRC4 protein expression was diminished in infected B cells at 24 h postinfection (Fig. 4E), which correlated with the downregulation of NLRC4 mRNA. These results together suggest a mechanism by which Salmonella downregulates NLRC4 expression, avoiding inflammasome activation and subsequently preventing the secretion of IL-1β, which is required for the control of infection. 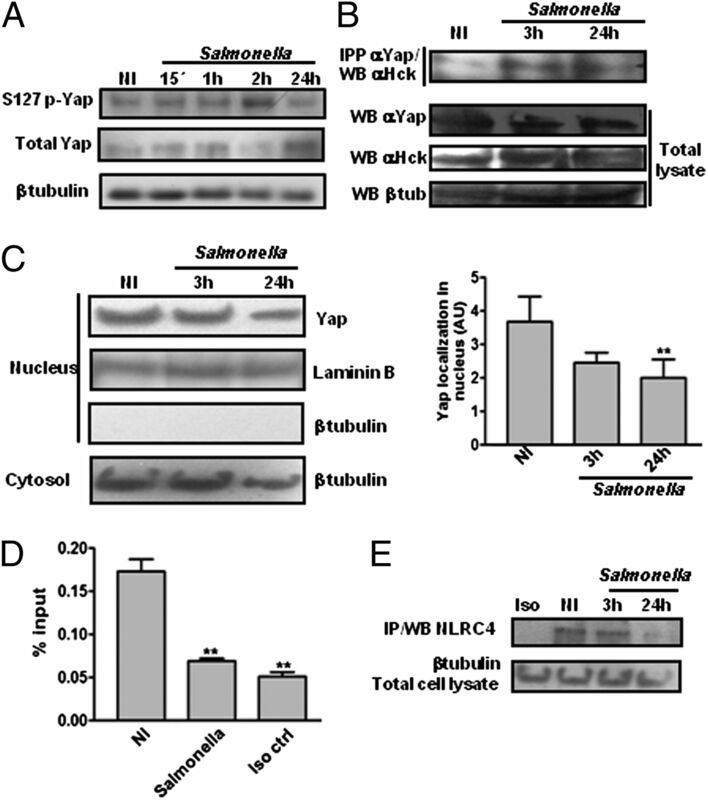 Salmonella impairs Yap coactivator activity in infected B cells. (A and B) B cells were infected with Salmonella, and the total protein was recovered at the indicated time. The phosphorylation of Yap at S127 was evaluated by Western blotting (A). The interaction between Yap and Hck in infected cells was assayed by immunoprecipitation with an anti-Yap Ab and revealed with an anti-Hck Ab (B). The nuclear fraction was obtained from noninfected (NI) and infected B cells, and the presence of Yap in the nucleus was assessed by Western blotting and analyzed by densitometry. Laminin B expression was used as a nuclear fraction control, and β-tubulin expression was used as a cytosolic fraction control (C). Infected and NI cells were processed for ChIP using a specific Ab for Yap. Real-time PCR was performed using specific primers for the NLRC4 promoter sequence, and the results are presented as the percentage of input (D). Total proteins were obtained from NI cells and infected cells at the indicated times, and NLRC4 was immunoprecipitated and revealed with an anti-NLRC4 Ab (E). Results are presented as the mean ± SD. **p < 0.01. The production of proinflammatory cytokines such as IL-1β promotes the control of bacterial infection by macrophages. Given that B cell IL-1β secretion is impaired during Salmonella infection, we evaluated the survival of the bacterium in B cells. Macrophages control the Salmonella infection better than B cells because the numbers of CFUs recovered at 24 h postinfection remain constant (Fig. 5A), and we found that 68.5 ± 4.5% of bacteria survived in B cells, whereas only 1.6 ± 0.1% survived in macrophages (Fig. 5B). B cells are resistant to the cytotoxic effect induced by Salmonella. (A and B) B cells or BMDMs were infected with Salmonella; at the indicated time points, cells were lysed with Triton X-100 (1%), and dilutions were plated onto LB agar to determine the CFUs (A). The percentage survival of Salmonella was calculated using the following formula: (CFUs 0 h PI/CFUs 24 h PI) × 100 (B). (C and D) B cells (C) or BMDMs (D) were infected at the indicated MOI, and the percentage cytotoxicity was determined by LDH release at 24 h postinfection. (E) The percentage cytotoxicity was determined in sorted Salmonella-GFP–infected B cells 24 h postinfection. B cells containing Salmonella-GFP (GFP+); B cells without Salmonella-GFP (GFP-). (F) Flagellin was loaded into the cytosol of B cells using DF; then cytotoxicity was measured. Results are representative of three independent experiments. Mean ± SD is shown. *p < 0.05, ***p < 0.001. GFP+, B cells containing Salmonella-GFP; GFP−, B cells without Salmonella-GFP. 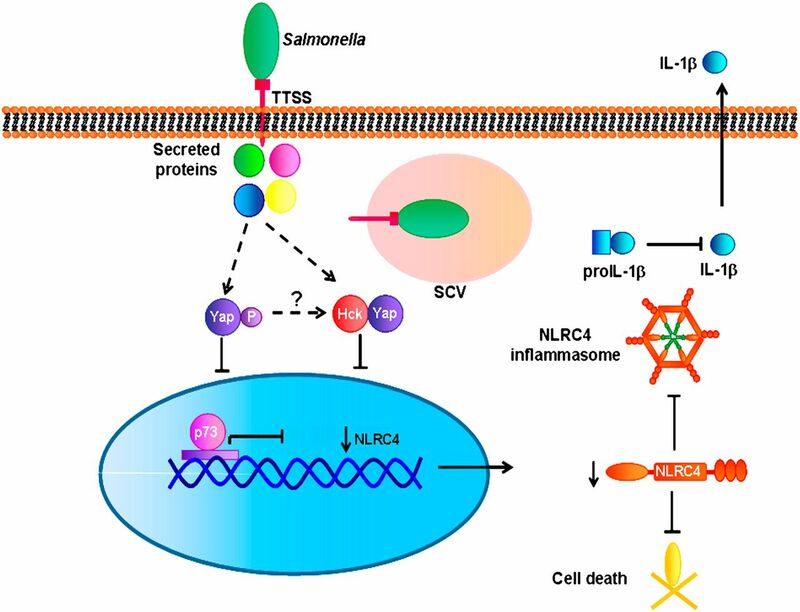 It has been reported that the activation of the NLRC4 inflammasome in macrophages during Salmonella infection results in cell death because macrophages deficient in NLRC4 do not die when they become infected with Salmonella (13). Therefore, we analyzed the cytotoxic effect on B cells with increased doses of bacterial infection. In comparison with macrophages, B cell death did not increase independent of the MOI (Fig. 5C, 5D). When we sorted Salmonella-infected (GFP+) and -uninfected (GFP−) B cells, the level of cytotoxicity remained similar (Fig. 5E). However, when B cells were stimulated with cytosolic flagellin, cell death rate increased to 50% (Fig. 5F). These data correlate with our previous finding of a function of the NLRC4 inflammasome in B cells, because of adequate IL-1β secretion in addition of cell death induction in the presence of flagellin in the cytosol. These results demonstrate that unlike macrophages, B cells are resistant to the cytotoxic effect induced by Salmonella. The expression of NLRC4 is induced by doxorubicin (32), a drug that also induces cell death (17, 18). We analyzed whether Salmonella infection would be able to prevent B cell expression of NLRC4 B and cell death induced by doxorubicin. Indeed, we found that doxorubicin induced cell death in B cells, as 68.0 ± 6.5% of the cells were TUNEL+, whereas only 41.1 ± 1.5% of Salmonella-infected cells treated with doxorubicin were TUNEL+; cells that were treated with LPS were not rescued from apoptosis (Fig. 6A–C). The expression of NLRC4 was increased in doxorubicin-treated cells, in contrast with that in infected cells and cells stimulated with doxorubicin and LPS (Fig. 6D). Thus, the rescue of B cells from apoptosis correlates with the lack of an increase in NLRC4 expression. Salmonella protects B cells from doxorubicin-induced apoptosis. (A and B) B cells were infected with Salmonella and cultured in the presence of doxorubicin (500 ng/ml; top panel) or cultured with LPS (100 ng/ml) and doxorubicin (500 ng/ml; bottom panel). Four hours later, cells were harvested and labeled with TUNEL. Cells were then analyzed by flow cytometry (A) or fluorescence microscopy (B). Scale bar, 5 μm. (C) Percentage of TUNEL+ cells was determined. (D) NLRC4 expression was measured simultaneously using qRT-PCR. Data are representative of two independent experiments. Mean ± SD is shown. *p < 0.05, **p < 0.01, ***p < 0.001. We have previously demonstrated that Salmonella infects B cells. In fact, Salmonella survives more efficiently within B cells than in macrophages, and it can be recovered from splenic B cells, bone marrow B cell precursors, and plasma cells after a single-dose inoculation (8). However, the mechanisms used by Salmonella to survive within B cells are not established. During Salmonella infection, macrophages and nonphagocytic cells produce proinflammatory cytokines that promote control of the infection (33). Among the mechanisms involved in the production of proinflammatory cytokines are the TLR and NLR pathways (34, 35). NLRs recognize their ligands to promote the formation of a protein complex called the inflammasome. This is responsible for activating caspase-1, to generate the mature form of IL-1β (29). It has previously been shown that IL-1β is secreted by macrophages infected by Salmonella, and this response is based on the recognition of flagellin by NLRC4 (13). By contrast, in this article, we revealed that in a dose-dependent manner, Salmonella can inhibit IL-1β secretion when it infects B cells. This result clearly indicates that macrophages and B cells respond differently to Salmonella infection. 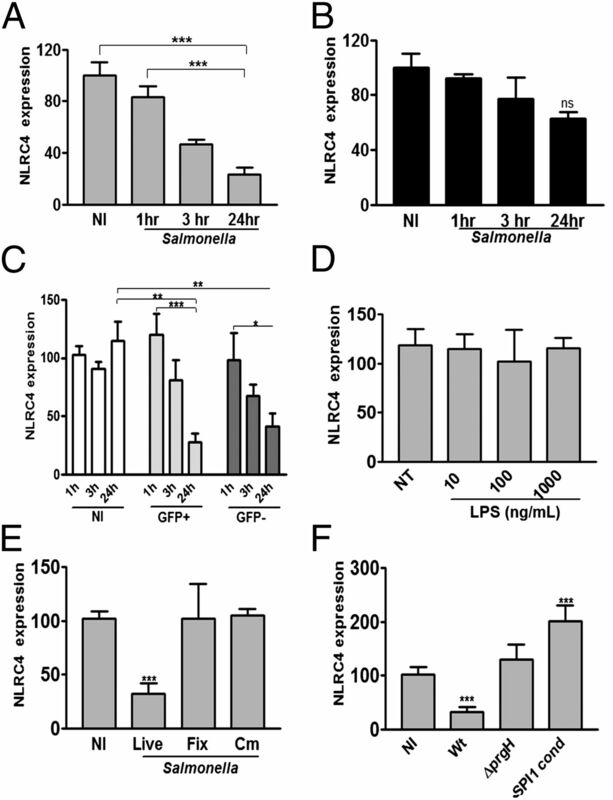 In fact, Salmonella downregulated NLRC4 transcription in B cells, but not in macrophages (Fig. 3B). Previous findings demonstrated that other bacterial and viral pathogens have different mechanisms to inhibit the activity of the inflammasome complex, including the expression of proteins homologous to components of the inflammasome or proteases that inhibit the activation of caspase-1 (36, 37). To our knowledge, NLRC4 downregulation had not been previously observed in any type of viral or bacterial infection. Thus, downregulation of the inflammasome might be a strategy for evading the innate immune response to permit Salmonella survival within B cells. Interestingly, internalization of the bacterium is not necessary for this downregulation to occur, suggesting that some structure on the surface of the bacteria is involved in this phenomenon. Salmonella requires the TTSS and the effectors of SPI-1 to infect B cells (26). The requirement of SPI-1 for the invasion of epithelial cells has been extensively studied, and we know that the TTSS is engaged when the bacteria come into contact with the cell and is used to translocate effector proteins to induce Salmonella entry (38, 39). We found that the TTSS is required to decrease NLRC4 expression; we then concluded that the TTSS is assembled when the bacteria contact the B cell, as observed in epithelial cells, and Salmonella might secrete a protein responsible for the downregulation of NLRC4. Moreover, the requirement of the TTSS for the downregulation of NLRC4 might explain why this phenomenon is observed only in B cells, because the TTSS is involved in bacterial entry into B cells, but it is not required for entry into macrophages (40). However, when bacteria are grown under SPI-1–inducing conditions, we observed an increase in NLRC4 expression. This suggests that although the protein is secreted by the TTSS, the effectors encoded by the SPI-1 are not responsible for the downregulation of NLRC4; those effectors might function in a similar manner as they do in epithelial cells. In fact, it has been reported that in epithelial cells, the translocation of AvrA, an SPI-1 effector protein, increases p53 acetylation and, therefore, promotes the transcriptional activity of this transcription factor (41). It has also been demonstrated that p53 is a positive transcriptional regulator of NLRC4 (17). In addition to p53, p73 is also involved in the expression of NLRC4 (17, 18). Whereas p53 binds to the promoter region of its target genes as a homodimer (42), p73 forms a heterodimer with Yap. The p73-Yap heterodimer is more efficient than the p53 homodimers, because Yap increases stability and accumulation of p73 on the promoter region (19). Moreover, the mechanisms responsible for the negative regulation of NLRC4 expression are the phosphorylation of Yap by AKT kinase and the interaction of Hck with Yap, and both mechanisms retain Yap in the cytosol and consequently prevent the transcription of NLRC4 (18, 20). In Salmonella-infected B cells, we observed an increase in the amount of phosphorylated Yap, and we also observed heterodimers formed by Yap and Hck; consequently, this prevents Yap translocation to the nucleus, resulting in downregulation of NLRC4 mRNA and thus NLRC4 protein. Activation of NLRC4 in macrophages during Salmonella infection, in addition to the production of the mature form of IL-1β, also induces cell death. In fact, NLRC4 was initially described as a proapoptotic molecule (17). In contrast with macrophages (13), B cells were resistant to cell death induced by Salmonella. However, if B cells are stimulated with cytosolic flagellin, cell death is observed as it has been described in macrophages (13). This result demonstrated that NLRC4 is fully functional in B cells and presents the possibility that flagellin is not efficiently translocated to the cytosol during infection. Additional evidence that the downregulation of NLRC4 by Salmonella affects B cell survival is demonstrated by the fact that infected B cells are more resistant to cell death induced by doxorubicin, a chemical agent that promotes the expression of NLRC4. Moreover, delivering flagellin to the cytosol of infected B cells does not result in caspase-1 activation and IL-1β secretion. In addition to the participation of NLRC4 in IL-1β secretion and cytotoxicity, this molecule also has a role in controlling Legionella replication (43–45) and phagosome maturation during Legionella infection (30). Hence, the downregulation of NLRC4 in B cells may also have an impact on Salmonella replication and phagosomal maturation. Indeed, we have observed that Salmonella resides in a lysosomal compartment, and large numbers of bacteria are recovered from this compartment (8). Via the aforementioned mechanism, B cells are an ideal niche for Salmonella. B cells permit the bacteria to remain for long periods in the host and spread to different organs. In this context, we have revealed that bone marrow cells are infected after a single dose of bacteria (10). In summary, this study demonstrates that Salmonella induces downregulation of NLRC4 in B cells by a protein secreted through the TTSS that induces the phosphorylation of Yap and the interaction of Yap with Hck. The downregulation of NLRC4 prevents the efficient maturation of IL-1β and the resulting cytotoxicity. This may help the survival of Salmonella within B cells (Fig. 7). These events provide further support that B cells are an amenable intracellular environment for Salmonella, enabling its survival and favoring its persistence and dissemination. Mechanism used by Salmonella to downregulate NLRC4 in B cells. A Salmonella-secreted protein injected by the TTSS into the B cell cytosol induces the phosphorylation of Yap and its interaction with Hck. This protein retains Yap in the cytosol and prevents its translocation to the nucleus. This results in a decrease in the efficiency of NLRC4 transcription with a consequent decrease in the expression of this receptor in B cells, preventing both the secretion of IL-1β and the induction of cell death. We thank Victor Hugo Rosales (Centro de Investigación y Estudios Avanzados del Instituto Politecnico Nacional) for assistance with the FACS and flow cytometry experiments and Leticia Aleman for assistance with some Western blotting experiments. This work was supported by Consejo Nacional de Ciencia y Tecnologia Grants SEP-48687M (to C.M.A.-A. ), SEP 132310 (to V.O.-N.), and CVU 205934 (to A.P.-L.).
. 1989. The antibody response to salmonellae in mice and humans studied by immunoblots and ELISA. Microb. Pathog. 6: 445–454.
. 2011. Immunity to salmonellosis. Immunol. Rev. 240: 196–210.
. 2003. Characterization and development of T-cell immune responses in B-cell-deficient (Igh-6(-/-)) mice with Salmonella enterica serovar Typhimurium infection. Infect. Immun. 71: 6808–6819.
. 2009. B cell receptor-mediated internalization of salmonella: a novel pathway for autonomous B cell activation and antibody production. J. Immunol. 182: 7473–7481.
. 1995. Cytotoxic T lymphocytes after oral immunization with attenuated vaccine strains of Salmonella typhi in humans. J. Immunol. 155: 3987–3993.
. 1994. Entrance and survival of Salmonella typhimurium and Yersinia enterocolitica within human B- and T-cell lines. Infect. Immun. 62: 2229–2235.
. 2001. In vivo activation of dendritic cells and T cells during Salmonella enterica serovar Typhimurium infection. Infect. Immun. 69: 5726–5735.
. 2005. Survival of Salmonella enterica serovar Typhimurium within late endosomal-lysosomal compartments of B lymphocytes is associated with the inability to use the vacuolar alternative major histocompatibility complex class I antigen-processing pathway. Infect. Immun. 73: 3937–3944.
. 2007. Analysis of cells targeted by Salmonella type III secretion in vivo. PLoS Pathog. 3: e196.
. 2009. B cell precursors are targets for Salmonella infection. Microb. Pathog. 47: 52–56.
. 2011. Pathogen recognition by the innate immune system. Int. Rev. Immunol. 30: 16–34.
. 2003. Toll-like receptors. Annu. Rev. Immunol. 21: 335–376.
. 2006. Cytosolic flagellin requires Ipaf for activation of caspase-1 and interleukin 1beta in salmonella-infected macrophages. Nat. Immunol. 7: 576–582.
. 1996. Salmonella typhimurium invasion induces apoptosis in infected macrophages. Proc. Natl. Acad. Sci. USA 93: 9833–9838.
. 2001. Identification of Ipaf, a human caspase-1-activating protein related to Apaf-1. J. Biol. Chem. 276: 28309–28313.
. 2005. Caspase-1 activator Ipaf is a p53-inducible gene involved in apoptosis. Oncogene 24: 627–636.
. 2007. Regulation of p73 by Hck through kinase-dependent and independent mechanisms. BMC Mol. Biol. 8: 45.
. 2005. The transcriptional coactivator Yes-associated protein drives p73 gene-target specificity in response to DNA damage. Mol. Cell 18: 447–459.
. 2010. JNK phosphorylates Yes-associated protein (YAP) to regulate apoptosis. Cell Death Dis. 1: e29.
. 1989. Macrophage colony-stimulating factor (rM-CSF) stimulates pinocytosis in bone marrow-derived macrophages. J. Exp. Med. 170: 1635–1648.
. 2003. Salmonella effectors translocated across the vacuolar membrane interact with the actin cytoskeleton. Mol. Microbiol. 48: 401–415.
. 2000. Salmonella induces macrophage death by caspase-1-dependent necrosis. Mol. Microbiol. 38: 31–40.
. 1993. Prolonged inhibition of bacterial protein synthesis abolishes Salmonella invasion. Infect. Immun. 61: 1544–1546.
. 1989. Intracellular survival of wild-type Salmonella typhimurium and macrophage-sensitive mutants in diverse populations of macrophages. Infect. Immun. 57: 1–7.
. 2006. Use of chromatin immunoprecipitation (ChIP) to detect transcription factor binding to highly homologous promoters in chromatin isolated from unstimulated and activated primary human B cells. Biol. Proced. Online 8: 44–54.
. 2004. Toll-like receptors are temporally involved in host defense. J. Immunol. 172: 4463–4469.
. 1995. Exogenous tumor necrosis factor alpha and interleukin-1 alpha increase resistance to Salmonella typhimurium: efficacy is influenced by the Ity and Lps loci. Infect. Immun. 63: 3196–3198.
. 2006. Regulation of Legionella phagosome maturation and infection through flagellin and host Ipaf. J. Biol. Chem. 281: 35217–35223.
. 2012. Salmonella infects B cells by macropinocytosis and formation of spacious phagosomes but does not induce pyroptosis in favor of its survival. Microb. Pathog. 52: 367–374.
. 2010. Interaction with Sug1 enables Ipaf ubiquitination leading to caspase 8 activation and cell death. Biochem. J. 427: 91–104.
. 2001. Cytokines in host defense against Salmonella. Microbes Infect. 3: 1191–1200.
. 2011. Regulation of the antimicrobial response by NLR proteins. Immunity 34: 665–679.
. 2010. Inflammasome inhibition as a pathogenic stealth mechanism. Cell Host Microbe. 8: 7–11.
. 1994. Contact with epithelial cells induces the formation of surface appendages on Salmonella typhimurium. Cell 76: 717–724.
. 1995. Homologs of the Shigella IpaB and IpaC invasins are required for Salmonella typhimurium entry into cultured epithelial cells. J. Bacteriol. 177: 3965–3971.
. 1995. Spacious phagosome formation within mouse macrophages correlates with Salmonella serotype pathogenicity and host susceptibility. Infect. Immun. 63: 4456–4462.
. 2010. 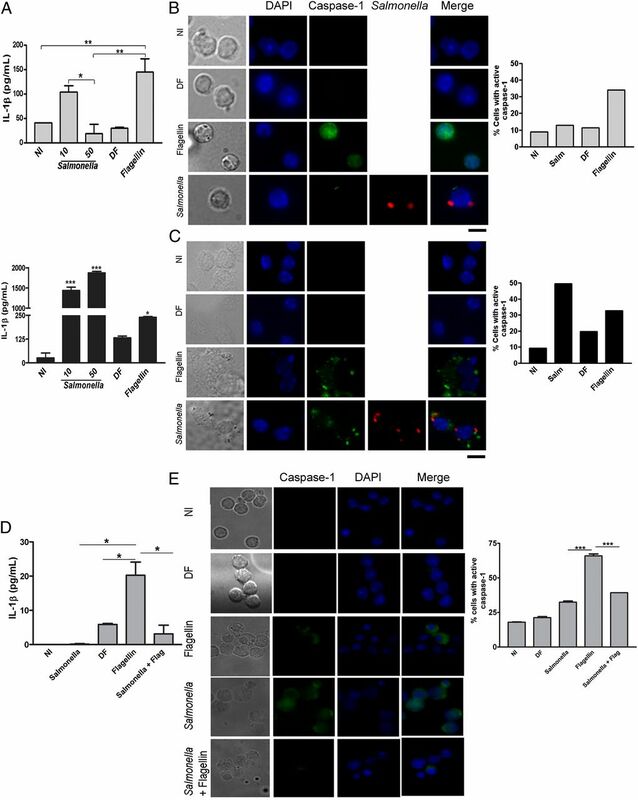 Salmonella typhimurium infection increases p53 acetylation in intestinal epithelial cells. Am. J. Physiol. Gastrointest. Liver Physiol. 298: G784–G794.
. 1993. Human p53 binds DNA as a protein homodimer but monomeric variants retain full transcription transactivation activity. Oncogene 8: 3165–3173.
. 2009. Restriction of Legionella pneumophila replication in macrophages requires concerted action of the transcriptional regulators Irf1 and Irf8 and nod-like receptors Naip5 and Nlrc4. Infect. Immun. 77: 4794–4805.
. 2008. NAIP and Ipaf control Legionella pneumophila replication in human cells. J. Immunol. 180: 6808–6815.